‘It’s the ultimate recognition,’ says the 2017 RCN in Wales Nurse of the Year Louise Walby. The respiratory nurse facilitator was almost lost for words as she received her award from RCN chief executive Janet Davies and Welsh cabinet secretary for health and social services Vaughan Gething at Cardiff City Hall on 15 November. Ms Walby was named RCN in Wales Nurse of the Year for her work tackling some of Britian’s highest mortality rates for chronic lung disease. In her work for Cwm Taf University Health Board, she sees patients across part of the Welsh valleys, an area with the fourth worst mortality rates in the UK for conditions such as asthma and chronic obstructive pulmonary disease. She helped to improve early recognition and intervention for high-risk patients, by delivering accredited training to improve the diagnosis of the conditions. Ms Walby undertook an audit of the provision and standard of lung function tests in primary care across the health board, and visited 50 GP practices to work with practice nurses and doctors. After identifying deficiencies in training for spirometry, the tests used to diagnose conditions that affect lung function, and realising that existing accredited training did not meet the needs of general practice nurses, Ms Walby developed a new programme, reducing the time nurses had to spend away from their practice. She gained accreditation for the course, which has been rolled out across Wales through the Respiratory Health Implementation Group. Ms Walby, who also won the Primary Care Nursing award, told Nursing Standard: ‘I feel very honoured and privileged to receive these awards. 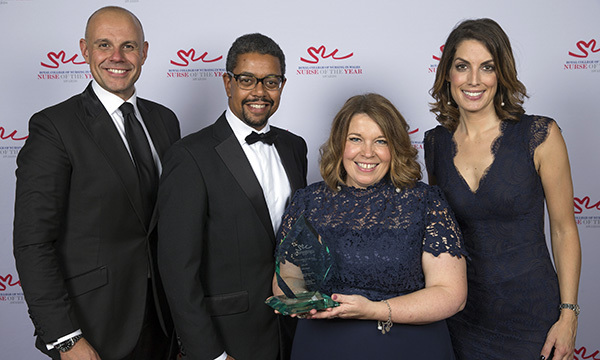 Aneurin Bevan University Health Board divisional nurse Tanya Strange was also recognised on the night, receiving a Lifetime Achievement award and the Innovation in Nursing award. She was praised for her work on the ‘Ffrind i mi/Friend of Mine’ project, which sees charities, health and civic organisations working to reduce social isolation and loneliness. Ms Strange said: ‘This is something that is nurse led, but that spreads across boundaries and is about the well-being of our population. It has created a real social movement, so members of our community are helping others. Collecting the Lifetime Achievement award, Ms Strange declared she was not done yet. She is working on a ‘Pimp My Zimmer’ campaign to make sure walking frames are not grey or silver, as these colours can be difficult for some older people to see, and is also organising a conference next year and wants to work with the business community to promote public health. The awards also saw the launch of an initiative called the RCN in Wales Nurse of the Year Alumni Network. RCN Wales says the initiative will offer a pathway of personal and career development opportunities, and create a network of innovative nurse leaders who will promote nursing in Wales and further afield. During the evening both RCN Wales director Tina Donnelly and RCN chief executive Janet Davies thanked nurses for their efforts during the Scrap the Cap campaign. Lynfa Day, paediatric respiratory and atopic clinical nurse specialist, Cwm Taf University Health Board. Adele Watkins, clinical nurse specialist for children and young people in crisis, Children’s Hospital for Wales, Cardiff and Vale University Health Board.